It’s not nice to be triumphal but the newspapers have been enjoying themselves over the latest advertisement from The Labour Party. The Spectator on Friday reported that Labour has a long, hard slog to arrest the public’s loss of faith in its economic competence. The party’s latest advert hasn’t helped. 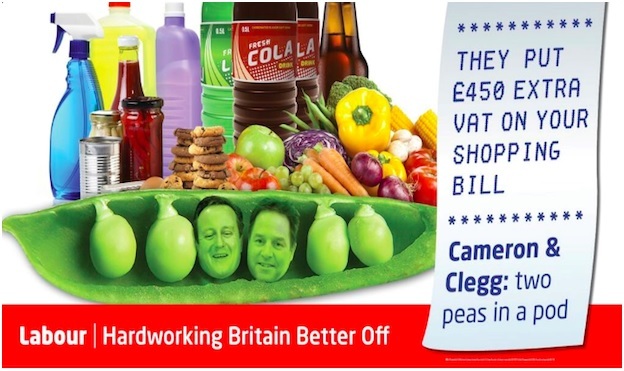 It shows David Cameron and Nick Clegg as two peas-in-a-pod whose VAT hike has put £450 on the annual shopping bill. There’s one big problem with the advert: it makes its claim in front of a whole bunch of foods on which VAT is not payable. Basic food is subject at zero per cent. Even the chocolate-chip biscuits. There are some 24 products in the picture and 18 of them are VAT exempt: Fresh fruit and vegetables (peas, sweetcorn, mushrooms, tomatoes, peppers, broccoli, red onions, beans, red cabbage, carrots, grapes, apples) eggs: all zero-rated. Even the chocolate chip biscuits are zero-rated. Canned and preserved vegetables have the same VAT liability as their unprocessed equivalents. So, which goods attract 20 per cent VAT? The three cleaning products, the cola, the lemonade and the beer. It doesn’t end there. Labour might be complaining about the VAT rise, but to pay an extra £450 as a result of the VAT increase, you’d need to be spending £21,000 on goods attracting VAT at the full rate – something that would mean you were in the top fifth of income earners – and likely to be spending £40,000 a year on goods and services The Sun’s editorial on Saturday describes the advertisement as a “schoolboy error (which) is the latest cheap shot in a shallow election campaign that doesn’t bear close scrutiny. And it’s highly embarrassing for leader Ed Milliband who just days ago claimed he was cleverer than David Cameron”. It i s rare that I can agree with David Blunkett. “This sense of decay at the heart of democracy is profoundly troubling to me, since I have always had a powerful belief in the political process. … It is 50 years since Professor Bernard Crick’s classic work, In Defence Of Politics, was published. One of his central arguments was that the political process is bound to be messy, full of setbacks, compromises and failures precisely because it is trying to reconcile different opinions and the contradictions of human nature. That messiness was often the cause for frustration, even despair, Crick admitted, but we should never abandon democracy as a result of it. It is a fallacy to think we could run our society successfully without elected politicians. How would competing claims for money be reconciled without them? How would tax rates be decided or budgets settled? How would major services be reformed? The political process provides the only credible, fair way of making such decisions. The governance of a nation has to take account of myriad other factors, like fairness, compassion, resources, history, timing and public support. And at least politicians are accountable for their actions and can be chucked out if the public does not like them. Yet according to opinion polls, there is a growing belief that our country could do without politicians and could be run by technocrats”. And perhaps this explains why some of us believe that running a council on the basis of “no overall control” means that someone else or some other people are in control but they are not elected nor are they directly accountable to the electorate. Last week the Joint Standards Committee of Babergh and Mid Suffolk issued an Advice Note “‘Blogging’ & Social Network Sites”. Nearly five hundred words of what should be obvious. Of course we all have to observe the Seven Principles of Public Life; selflessness, integrity, objectivity, accountability, openness, honesty and leadership. Where is t he respect for the people when their representative is hypocritical, misleading or less than competent. Local politics like many organisations can be maelstrom of ideas being advanced and like it or not it can be a zero sum game. If there is only a limited amount of money to be distributed why should monies go to the Dance East Boys in Babergh programme in preference to Home-Start Babergh? The Boys in Babergh programme speaks for itself. 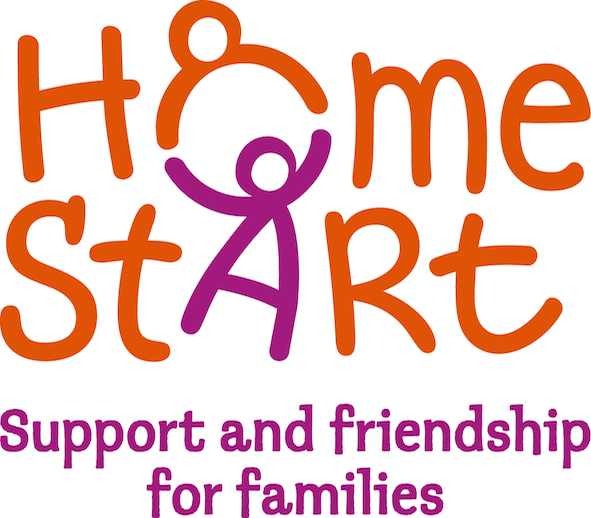 Home-Start Babergh is an independent charity that operates as part of Home-Start UK. They recruit, train and provide volunteers that work with families in times of need. More importantly their support is given through home visits by volunteers and through support group meetings, where children can play together, supervised by a play leader, whilst parents meet with each other and with Home-Start staff. In many cases, their support is complementary to that of the professional agencies. Their volunteers are there for the family as a friend and confidant during a time of stress or difficulty. See: http://www.home-startbabergh.co.uk/. Similarly why should the Dance East Boys in Babergh programme take precedence over the Kernos Centre. It provides counselling and support services to people with emotional and psychological difficulties from a wide variety of causes. So, returning to the advice from the Joint Standards Committee: I hear what they say but it will not stop me from speaking out in a forthright and robust manner when I deem it appropriate.